Northeast Georgia Health System (NGHS) is a not-for-profit community health system. 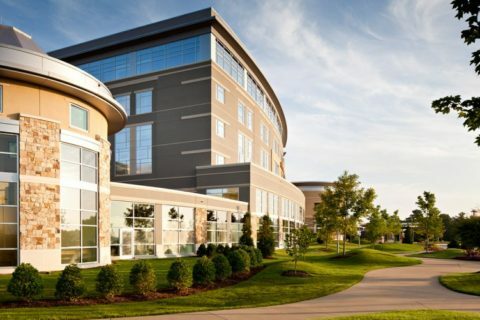 It consists of two hospitals –Northeast Georgia Medical Center Gainesville (Georgia’s #1 Hospital by CareChex®), a Level II Trauma Center with 550 beds and Northeast Georgia Medical Center Braselton with 100 beds, as well as the Northeast Georgia Physicians Group with over 250 Physicians, Physician Assistants and Nurse Practitioners, along with other clinical staff at more than 80 locations. The opening of our new Northeast Georgia Medical Center Braselton created 859 new jobs at the Braselton facility along with backfill at NGMC Gainesville. The NGHS recruitment team partnered with Fusion Marketing Group to create an ongoing staffing program that would not only fill jobs as they became available, but also build a talent pipeline of qualified candidates that could be hired in phases as the new hospital neared completion. A microsite developed specifically for jobs at the new Braselton facility, enabling interested candidates to stay informed as jobs became available. A form on the site provided easy sign up and created a database of candidates for NGHS. Eight (8) recruitment events were held onsite at the facilities, and two (2) out-of-market events were hosted at hotels, bringing over 300 hires to the System. Fusion promoted the events and overall hiring efforts by leveraging a number of ongoing recruitment marketing tools to keep costs low and ROI impressive. Call out banners and “Hot Jobs” text links to promote events and hard to fill jobs were placed on the career website homepage. This resulted in over 600 hires with no external advertising, including job postings. A unique Fusion program enabled the NGHS career website to instantly customize and personalize experiences depending upon visitor behavior and demographics. For example, visitors from the Braselton zip codes were redirected to the Braselton microsite during the early phases of the campaign to encourage sign ups and to build the candidate pipeline. Search marketing campaigns included both Google and Bing pay-per-click, and jobs were strategically sponsored on Indeed. A CRM dashboard allowed recruiters to interact directly with interested candidates who had completed the career website form but had not yet completed their application. An email program segmented by specialty area, notified potential candidates in the pipeline when new positions became available. Online retargeting banner ads were served to visitors who searched jobs in the ATS but did not complete the application. Direct mail and email were utilized to precisely target hard to fill clinical and managerial candidates. Since July 1, 2014 we have filled 3,064 positions for the Health System. We would not have been able to accomplish this without our partnership with Fusion to help us with career fairs, strategies with our search engine optimization, and research of the target areas to bring the highest ROI in our marketing strategy.